Park Midway Bank was one of 21 banks recently recognized by the Minnesota Bankers Association (MBA) for their community involvement. Banks play an important and vital role in their communities, and to honor and recognize their involvement, the MBA created the Community Champion recognition program. These banks worked with hundreds of organizations in their communities, providing funding, volunteers, materials, supplies, or food for their neighbors. The 21 banks volunteered more than 180,000 hours and more than 1,800 employees participated. Recipients of the recognition range in size from small community banks (asset size of $66 million) to large banks with multiple branches ($8.1 billion). Many of these banks reported over 50 percent of the bank’s employees volunteered on behalf of their bank for organizations such as the Rotary, 4H, Second Harvest Heartland, Catholic Charities, Boy Scouts, Minnesota Business Venture, Junior Achievement, United Way, Habitat for Humanity, local schools, churches, or non-profits. Recipients were recognized with a certificate and at the MBA Bank Day at the Capitol event Feb. 5 in St. Paul. MidModMen+friends, a retail store featuring midcentury and modern furniture and home décor, will stick around the storefront at 2401 University Avenue that it moved into last fall. The store opened in October 2012 as a short-term pop-up shop, but owner Neal Kielar said customer and neighborhood response was so positive that store partners decided to stay. MidModMen+friends found the space through the St. Anthony Park Community Council’s (sapcc.org) “pop-up shop” program. That program, supported by the Starling Project (starlingproject.com) enabled a variety of organizations—from artists and theater groups to political organizations—to rent the space for brief periods last summer. The arrangement was part of a broader stopgap effort to bolster commercial activity along the 11-mile Green Line light-rail line being built to connect downtown Minneapolis and St. Paul. Kielar and partners Jon Mehus, Mary Warner and Erik Warner scour the region and country for high-quality furniture and décor to stock the store. The store also carries the work of local artists, such as Kendell Lindsay whose photography is currently showcased. MidModMen+friends is located a half block west of the Raymond Avenue intersection. 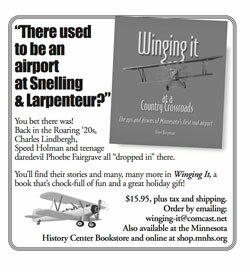 The store is open every Saturday and Sunday from 11 a.m. to 5 p.m. There are extended store hours in conjunction with special events and promotions. Store hours, inventory postings and other information is available at Facebook.com/MidModMen. 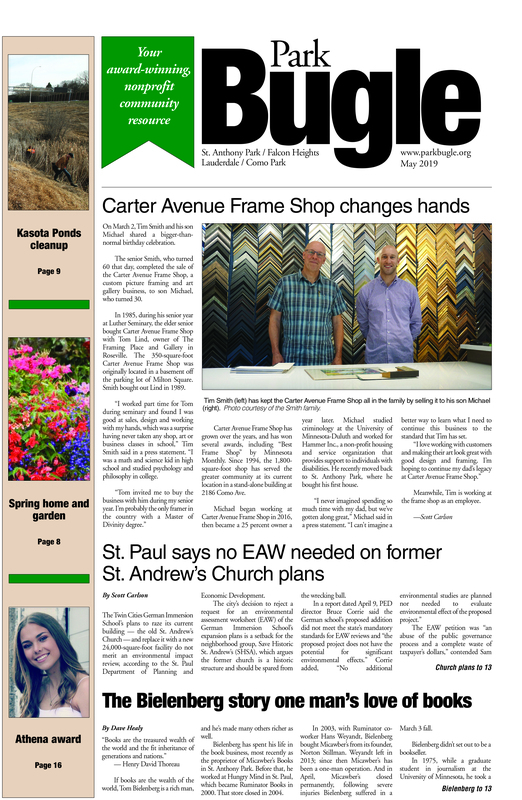 Carter Ave. Frame Shop has earned the service industry-coveted 2012 Angie’s List Super Service Award, an annual award given to about 5 percent of all the companies rated on Angie’s List, the nation’s leading provider of consumer reviews on local service companies. “We are honored to be able to serve our clients well over the years. Their appreciation of our work means a lot to us as we strive to be the best frame shop in the Twin Cities,” says owner Tim Smith. Super Service Award recipients are part of a select group of companies rated on Angie’s List that can claim the exemplary customer-service record, according Angie’s List founder Angie Hicks. Lyngblomsten of St. Paul received the 2013 Excellence in the Workplace Award from Aging Services of Minnesota in early February. The Workplace Award—one of the highest honors for aging services organizations and professionals in Minnesota—recognizes an employer for progressive practices that enhance employee satisfaction and retention, promoting careers in the field of senior services and investing in its employees. Paul Mikelson, president and CEO, accepted the award for Lyngblomsten in front of an audience of 1,500 aging services professional colleagues who gathered in Minneapolis for the 2013 Aging Services Institute. Lyngblomsten was founded by a group of Norwegian women who chose the name to honor their home country of Norway, where at the time the lyng was the national flower. Lyngblomsten offers scholarship funds to promote careers in older adult services and has formed partnerships with a number of outside organizations, including local colleges, public schools, Easter Seals and the Jobs Corps. The scholarship program has assisted 29 employees who have been or are currently in LPN or RN programs. Lyngblomsten has developed training for all staff in palliative, or comfort, care. It was selected by the Struthers Parkinson’s Center to be a designated site in the east metro, and the staff is undergoing 12 months of intensive training on Parkinson’s Disease and other movement disorders.